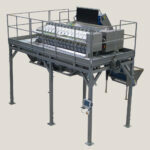 The RO1-120 horizontally closes tubular nets containing delicate fruit and vegetables. The machine uses metal straps wound in reels and also features a reel for inserting tape to be fitted in the net as a handle. A wine-glass label printer is included as well.